Anyone out there have a 62 with ACC code M on the trim tag? It is the only 62 ACC code not decoded? It has to be a very limited ordered option and specific combo unique to 62... any thoughts? • L- = Convertible top code followed by a number indicating color. 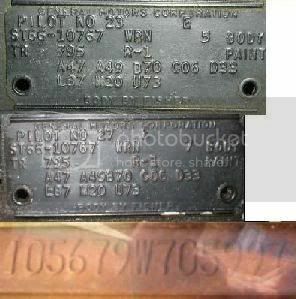 Picture of tag from a 1962 Monza Coupe..
Wow! How did I miss the "M" code when I was doing the 1962 bodytag survey. At the time of the Survey in 2005, I only had 1 car with the "M" code. Somehow it slipped my mind when I was listing all the letter codes for 1962!! It was a 4spd Monza 2 door coupe. Since 2005 I have added many more bodytags to my files and Have added a few more cars with the "M" code. All were Monza hardtops coupe and sedans. No Monza Convertibles and Wagons, and no 700 series bodytags with the "M" code in my files. Heres 2 more tags. Anyone see a commonality to the codes on these tags that might help decode the "M" code. I could never tell if this OA tag was an H or a M...Thoughts? ACC code K for Oakland built Monza's but nothing in the WR ACC code list!!! Also it fits that it hasn't been found on a vert or wagon as there is no rear package shelf to put the rear speaker!!! Edited 1 time(s). Last edit at 01/16/2017 12:39PM by ral1963. Hello, I saw a body tag on a WR '62 Monza coupe build date 08E. Body number 3700. Paint 900-5, ACC: AMO . It's a 102/4 speed. Wondering what M is for '62 as well! I thought that the rear speaker was not available until '63? Late 4 door and conv could have a rear speaker. VairSedanMan, Do you stil have access to the car with M ACC code? Does it or did it have a AM Radio with Rear seat speaker? RJ, I am going to have to dig and see if I can locate any and accessory catalogs for 62 and see if the AM radio and rear seat speaker was added or deleted for 62 under any FOA or RPO. I know option Z02 AM Radio with rear seat speaker is listed for 63 & 64, but was changed for 65 and later. I was always under the impression that there would be no code on that line, unless it required something from Fisher Body to do to the shell before they sent it over to the assembly plant. Can't see how it could be the rear package shelf speaker, since it doesn't require anything more than cutting a hole in the cardboard package shelf, and running the wire from the radio to the rear speaker. Looking at many other tags in this thread that sure looks like an "H" to me. I am also with the H on the ACC tag I listed, not M.
Junkman, Fisher used the Trim tag like the assembly line used build sheets. The code was just to remind the operator that something different or specific had to happen that was fairly out of the norm and potentially easy to miss. It is odd as there are differences between plants on options that use ACC codes vs not having a code due to that particular buildings processes or possible re-occurring quality misses. I would have to assume that like the side glass, backlite, and windshield, Fisher also ran the radio and antenna wiring and since the majority of the cars did not “need” special wiring to the rear of the car, the code was for at least this wiring, but not necessarily the actual speaker. What's the code for seat belts in '62? For 1962, the seatbelt option FOA-148 was not needed on the ACC line of the Fisher Trim tag as they were just a bolt in item. FOA-148 was ordered in individual seats, so you either ordered one or two depending on what seat or seats you wanted to have belts. Seat belts did not appear on Fisher tags until 1964. Fisher body punched the hole for the antenna, but the antenna was shipped loose in the trunk for the dealer to install on the car at delivery to the buyer. Knowing this has given me another thought.. If the dealer ordered the car as a radio delete, but wanted the hole in the fender punched, that is a possibility?